Be the first to share your favorite memory, photo or story of Willye. This memorial page is dedicated for family, friends and future generations to celebrate the life of their loved one. 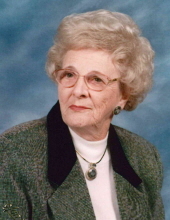 Mrs. Willye Bradley Dancy, age 91 of Hays, passed away Thursday, November 22, 2018 at her home. Funeral services will be held 3:00 PM, Sunday November 25, 2018 at Reins Sturdivant Chapel with Rev. David Sparks and Rev. Glenn Dancy, III officiating. The family will receive friends from 1:30 until 2:30 prior to the service at Reins Sturdivant Funeral Home. Graveside burial services will be held 11:00 AM, Monday at Mountlawn Memorial Park. Mrs. Dancy was born August 29, 1927 in Surry County to Willie Bradley and Lillie Patterson Bradley. She was a graduate of Ronda High School and Clevenger College in Wilkesboro. Mrs. Dancy retired as a Driver’s License Examiner from the State of North Carolina NC Driver’s License Division. She was a member of Liberty Grove Baptist Church in North Wilkesboro, where she was a former Sunday School Teacher, Bible School Director and a member of the church choir, WMU and Flower Committee. She loved her Church, her pastor and all members of the church. Mrs. Dancy attended Liberty Grove regularly until her health declined. In addition to her parents, she was preceded in death by her husband; Carroll Gambill Dancy, a son; Carroll Gambill Dancy, Jr. who passed away in 1971, four sisters; Lossie Bradley Cheek, Edna Bradley Darnell, Eulala Bradley Robbins and Mozelle Bradley Marsh, five brothers; Elbert Bradley, Glenn Bradley, Ellis Bradley, Paul Bradley and Bill Bradley. She is survived by a daughter; Glenda D. Barker and husband C.W. of Hays, a grandson; Brian Barker and wife Melissa Walker Barker of Sanford, FL and two great grandchildren; Alexandra Nichole Barker and Gabriel Andrew Barker of Sanford, FL. Flowers will be accepted or memorials may be made to Liberty Grove Baptist Church Fellowship Hall Fund 5899 River Road/Liberty Grove Church Road North Wilkesboro, NC 28659. To send flowers or a remembrance gift to the family of Willye Bradley Dancy, please visit our Tribute Store. "Email Address" would like to share the life celebration of Willye Bradley Dancy. Click on the "link" to go to share a favorite memory or leave a condolence message for the family.